SpaxTel is an International Calling App and Conference Calling App for people who want a high quality call from any phone to anywhere in the world, with or without a stable Internet connection.Make low cost international calls with No Internet required using our regular call technology. Choose the level of service you want from super cheap international calls (discount service level) all the way up to crystal clear quality calling (platinum service level).SpaxTel offers you international calling in two ways:1. 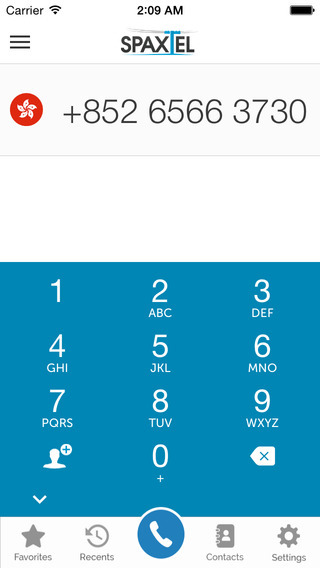 Regular Call Mode - When you make a call from any phone you will receive an incoming call from SpaxTel first – Our operator will then connect you to your destination number. 2. Internet Call Mode - Similar to other Internet to Phone services but SpaxTel has no connection fee and still gives you the choice to make use of good Internet to make cheap international calls.Other benefits of SpaxTel over most services include:1. No connection fee2. 3 Service levels - Platinum is for the highest call quality. Gold quality although not guaranteed is often as good as platinum - but cheaper. Discount service will give you the same cheap rate calls offered by most other service providers. You can even choose on a per call basis or set it as a default.3. Works from anywhere, on any phone, with or without Internet access.4. You can choose between Regular Call and Internet Call on a per call basis or set it as a default.5. You can initiate a call from your mobile and choose which phone to make the call from, such as your office or home phone because it is your preferred landline.6. Save money on roaming fees and international call costs.Note: SpaxTel is not designed to be used in an emergency to dial 911 or other emergency service numbers.